PESHAWAR -- Police on Tuesday (February 21) fatally shot two would-be suicide bombers before they could enter the courthouse in Tangi Tehsil of Charsadda District, Khyber Pakhtunkhwa (KP). A third bomber blew himself up. "The attackers wanted to enter the courts, as they opened fire and hurled hand grenades before one blew himself up," Charsadda District Police Officer Sohail Khalid told reporters. The explosion killed 8 people and injured 16 others, including four policemen, according to media reports. Rescue 1122 ambulances rushed to Charsadda from Peshawar and Mardan, with personnel fearing high casualties, Bilal Faizi, spokesman for the paramedic service, told Pakistan Forward. "Fourteen of those critically wounded were shifted to Peshawar," he said. 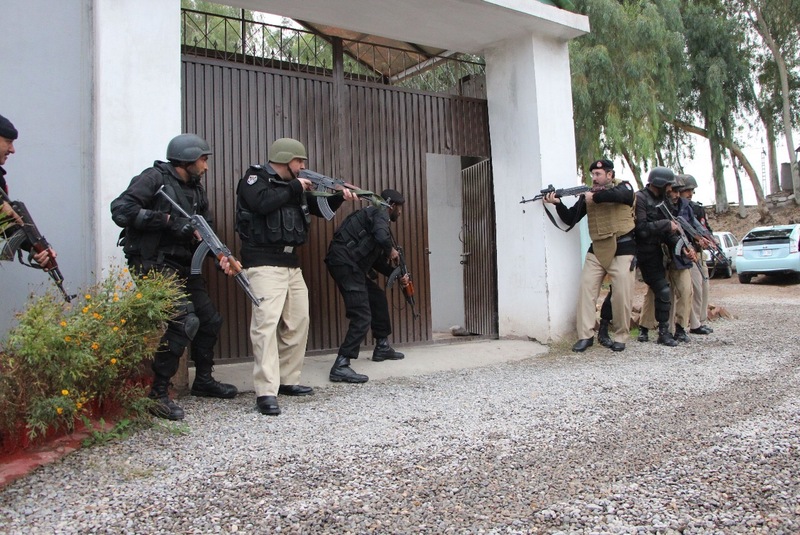 Police conducted raids in the Tangi Tehsil suburbs following the attack, and on Wednesday (February 22) arrested three suspected facilitators, Khalid said. Tehreek-e-Taliban Pakistan (TTP) faction Jamatul Ahrar claimed responsibility for the attack, one in a series of apparently co-ordinated assaults last week including a powerful bomb blast in Lahore that killed 14 people . The quick response by police prevented the much higher casualties that the terrorists undoubtedly wanted, police officials and eyewitnesses say. Fazal-ur-Rabi, the officer in charge of police security at the main gate of the courts, said he became suspicious when he saw two men approaching the gate, one of whom was wearing the traditional chador. "I called him from afar and told him to take off the chador as we don't allow them inside [the court]," Rabi said at Lady Reading Hospital in Peshawar, where he was undergoing treatment for injuries. When the suspects defied several warnings from Rabi to halt and to take off their outer garments, he gave the order to shoot. The police's response is winning high praise. 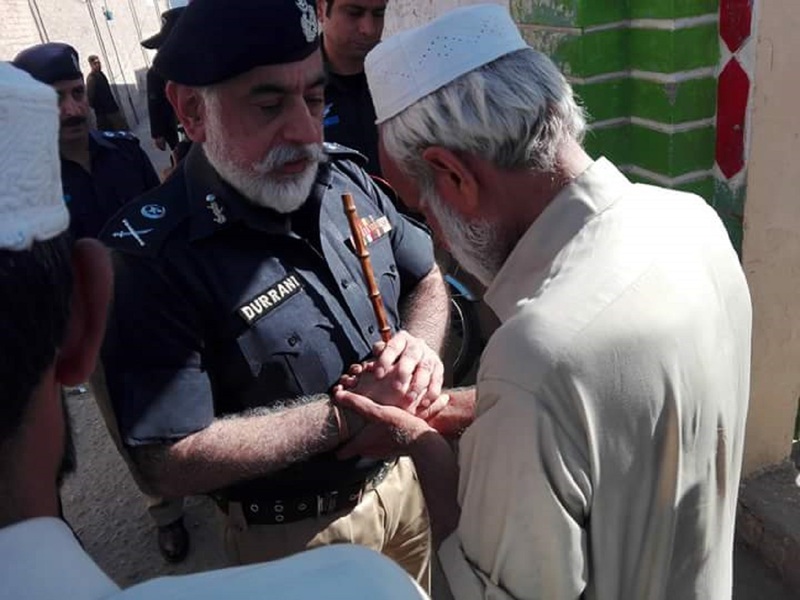 "The bravery and commitment showed by the Charsadda police to promptly respond to three suicide bombers are unprecedented," said KP Deputy Inspector General of Police Mohammad Saeed Wazir told Pakistan Forward. "The police were alert and they responded promptly; otherwise, dozens would have lost their lives," Umair Khan, a local resident and eyewitness, told Pakistan Forward. Police in all districts of KP have taken additional security measures in response to the recent threats, KP Inspector General of Police Nasir Khan Durrani told Pakistan Forward. "First tier police response has saved many lives," Inter-Services Public Relations Director General Maj. Gen. Asif Ghafoor tweeted, adding that Chief of Army Staff Gen. Qamar Javed Bajwa praised security forces for their prompt response. Lawyers on Wednesday boycotted courts across KP to protest militant attacks on courthouses. During a protest in Peshawar, lawyers acclaimed the police for their alert and swift action. "The police did a commendable job by neutralising the attackers in a prompt action," Pakistan Tehreek-e-Insaf party chairman Imran Khan said in a statement. "We are proud of the KP police who responded to kill the two suicide bombers before they could cause serious damage," Mushtaq Ghani, spokesman for the KP government and adviser to the chief minister on information, told reporters. The KP police officers who saved many lives are true heroes, he added. KP Chief Minister Pervez Khattak announced an Rs. 5 million ($47,703) reward to be shared by the policemen who killed the attackers. "The bravery shown by the policemen is extraordinary," he said. Pakistan has witnessed a surge in terror attacks since February 13, when a suicide bomber in Lahore killed at least 15 people including two senior police officers. The same week, a suicide bomber struck a van carrying judges in Peshawar, two suicide bombers attacked a government building in Mohmand Agency and bombs went off in Quetta and other parts of the country. The deadliest attack hit the shrine of Sufi saint Lal Shahbaz Qalander in Sehwan, Sindh Province, February 16. Ninety people were killed in the suicide bombing, according to AFP. Pakistani authorities remain resolute and confident. "I think these activities will not last for long as they have been weakened already," a former military officer and security analyst, Brig. (ret.) Asad Munir of Peshawar, told Pakistan Forward, referring to militants. The province has seen the number of terrorist attacks hit a ten-year low, police say, as security personnel step up operations.